An effort by Rep. Corey Wilson, R-Augusta, to move mental health patients who have committed violent criminal acts out of neighborhoods and back onto the former Augusta Mental Health Institute campus stalled Wednesday. AUGUSTA — An effort by an Augusta legislator to move mental health patients who have committed violent criminal acts out of neighborhoods and back onto the former Augusta Mental Health Institute campus stalled Wednesday when a legislative committee raised concerns about selling state property without advertising it to the public. Rep. Corey Wilson, R-Augusta, is sponsoring L.D. 340 in response to residents who complained when federal rules forced Motivational Services to relocate the patients off state property. 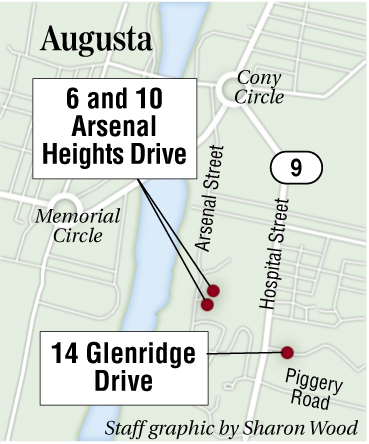 The move caught Augusta officials off guard over the summer and sparked fear among those living near Glenridge Drive and Green Street, the two new locations of the group homes. Wilson is asking fellow lawmakers to approve a bill that would authorize the sale of 6 and 10 Arsenal Heights Drive to the nonprofit mental health care provider that runs the group homes so the patients can be moved back to the former AMHI campus. During discussion of the bill, Republicans and Democrats expressed concern that the bill calls for the buildings to be sold to a specific buyer. Sen. Ron Collins, R-Wells, said the state has a public process for selling property that should be followed. “I have an uncomfortable feeling about giving exceptions to certain people,” he said. Don McCormack, director of the state Bureau of General Services, said after last year’s sale of state-owned property in Thomaston to the warden of the Maine State Prison — a deal that prompted an investigation and the return of the property to state hands — new guidelines were put in place to govern sales. “It would be much cleaner if we were able to market to the general public and give public notice,” he said. Motivational Services was required to move out of the state-owned property last year because federal guidelines would not allow the patients to continue to receive Social Security disability and other federal benefits while they lived on state property. Dr. Richard Weiss, executive director of Motivational Services, said Wednesday that legislators need to consider that the Arsenal Heights homes are set up for residential use and would be of limited interest to other parties. “It would only be in our interest to serve people with serious mental illness who the hospital cleared for discharge,” he said. McCormack said the homes, which were commonly referred to as the “Doctors’ Houses,” were slated for demolition at one time and would not be suitable for use as state office space. He also noted that a 2001 master plan calls for those two buildings and three others to be demolished to create an open space public park. Rep. Sharri MacDonald, R-Old Orchard Beach, reminded fellow committee members why the bill came up in the first place. Wilson pleaded with the committee to consider the Augusta situation an exception because the state put the city in a tough position by moving the patients without any notice. The committee likely will take up the bill again next week, and Wilson said he’s prepared to work to find a compromise.